The poster comes a day after Priyanka, who was abroad for some time, arrived in the national capital. New Delhi: Months ahead of the upcoming Lok Sabha elections 2019, posters of Congress president Rahul Gandhi and her sister Priyanka Gandhi Vadra have been plastered outside the party headquarters. 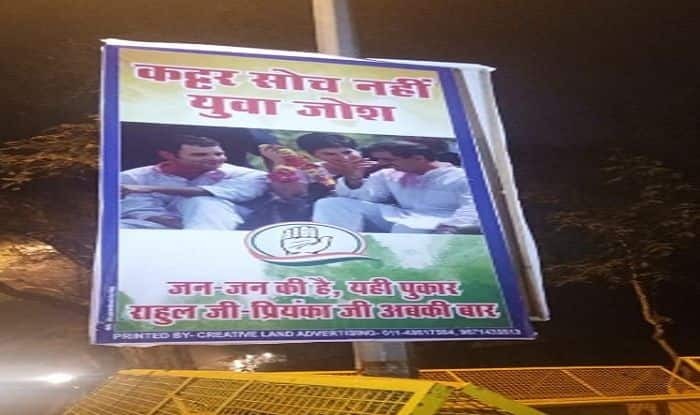 Calling for Congress’ victory, the poster also features Robert Vadra, Priyanka’s husband with a couple slogans, ‘Kattar Soch Nahi, Yuva Soch” (Not extremist ideology but young thinking), Jan-Jan Ki Hai, Yahi Pukaar, Rahul ji-Priyanka ji Ab Ki Baar” (People of the nation want Rahul and Priyanka this time). The poster comes a day after Priyanka, who was abroad for some time, arrived in the national capital. Upon her arrival, she reportedly reviewed the ongoing preparations for the Lok Sabha polls and conducted meeting with Rahul and other senior party leaders. Besides, Priyanka also held a meeting at Rahul’s residence with other Congress leaders and discussed the strategy for Uttar Pradesh-East as she has been made the general secretary for the region. She was appointed the Congress General Secretary for Uttar Pradesh East by All India Congress Committee (AICC) president Rahul Gandhi on Jan 23, few days ahead of the announcement of dates for the Lok Sabha Elections 2019 by the Election Commission of India. If reports are to be believed, she may contest the LS polls from Rae Bareli constituency. The seat is currently represented by her mother and UPA chairperson Sonia Gandhi, in Lok Sabha.